Andre is a blacksmith residing in the old church of Undead Parish. He specializes in physical and weapon enchantments using Faith. He explains the importance of reinforcing to make weapons stronger and ascending weapons to change their nature. He also gives a bit of information about the forbidden areas of Sen's Fortress and Darkroot Garden that connect to the Undead Parish through the old church. Otsuka: […] Are there any characters whose role changed dramatically as development progressed? Miyazaki: Oh, there are many, for example Andre of Astora. Originally he played a far more important role in the story. Satake: Andre is no longer related to Gwyn, is he? Miyazaki: Yes, we took that out. 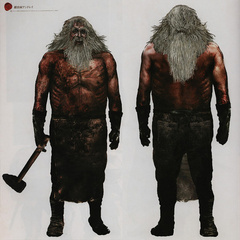 He was originally a descendant of Gwyn whose task was to protect a door within the Firelink Shrine. 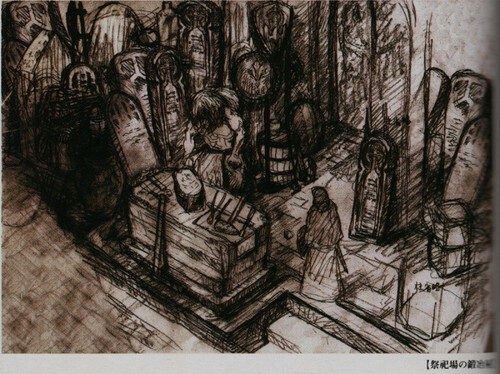 In the end, he was going to push aside the goddess statue to let the player progress, but as development progressed, he became just a simple blacksmith. Waragai: But there are still those statues that look like him around the game world, aren't there? Miyazaki: Yes, they are, but I don't think they are related, they're simply vessels which hold the embers. Cut content suggests that Andre of Astora would have been a much more complex character, possibly a descendant or even the Firstborn of Gwyn. He also has the ability to forge divine weapons that scale with Faith if given the Divine and Occult Embers, implying a possible relation to the gods; although, this is very speculative. 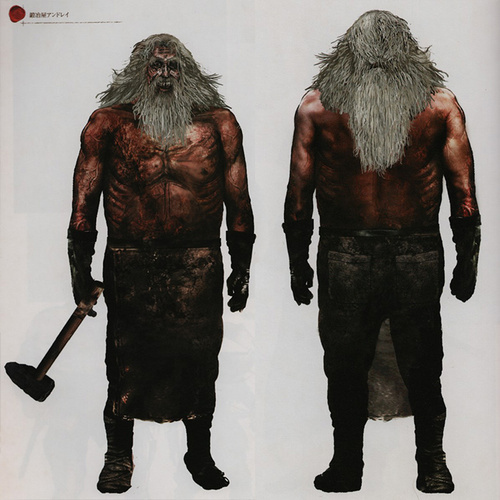 His role as the primary blacksmith makes him an important NPC, and his services are practically required in order to progress in the game. He is also somewhat protective of the player, and shows concern for the Chosen Undead's well-being. In that sense, it could be said that he is "watching over the player", but just like Solaire, he has this dialogue regardless of whether the player joins the Sunlight covenant. Speaking of Andre's dialogue, he also happens to be the only NPC character who has actual lip-syncing for his dialogue, which goes to show just how important his role in the game was originally intended to be. Having trouble accessing the Undead Church? I won't be needing it anymore. This is the old church. It was abandoned in favour of the church that you passed through. There are paths leading from here to two forbidden planes: Sen's Fortress, and the Darkroot Garden. They attract all sorts of lunatics, no-one as cultured as yourself. It's fine to be Undead, but keep a level head, eh? Hah hah hah! Sen's Fortress is an old proving grounds built by the ancients gods. It is the only route leading to the great Anor Londo. Of course, most fools can't even find their way into that fortified deathtrap. But they won't stop trying! Take that bumbling Sir Onion… Hah hah hah! I know little of the Darkroot Garden. Although I've heard rumours of a divine blacksmith who resides there. Those who get stumped in the Catacombs seek him for divine weapons. Oh, yes, and one other thing about the Darkroot Garden. 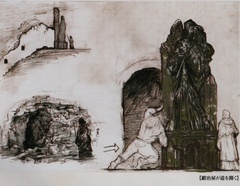 It is said to house the grave of Sir Artorias the Abysswalker. Only, of those who ventured into the forest, none has returned. Blacksmith Hammer Metal hammer of Andre of Astora, blacksmith at the Old Church.